Rookies Rashaad Penny and Will Dissly and oldster Brandon Marshall had big plays in Saturday’s scrimmage, suggesting that the Seahawks might have chosen newbies wisely. A moment after RB Rashaad Penny finished a full-blast breakaway run Saturday no 236-pound man should be capable of, a solo jet roared overhead in a steep acceleration, in full view of spectators watching the Seahawks’ first and only scrimmage of training camp. Thus is born Penny’s nickname: Blue Angel. The only question was which was faster. It was glorified practice for both. The Blue Angels go Sunday at Seafair, the Seahawks go Thursday against Indianapolis at the Clink. The difference is the routine of the Navy flyboys is familiar. There is relatively little that is familiar about the Seahawks. Including the presence of diminished expectations. Saturday was the first peek at dress rehearsal, although the game-like set-up included no tackling. Penny was among several of the newbies who offered a hint that the prophecies of pestilence, famine and assorted other sufferings for the Seahawks might be a tad exaggerated. Penny, the first-round draft choice from San Diego State and the NCAA’s rushing leader in 2017, took an inside handoff, swept right beyond the line of scrimmage and whooshed down the sidelines past the No. 1 defense for a long gain. For those witnesses who endured the lamentable rush game of the past two seasons, seeing a Seattle running back go that fast, that long was jarring. It was like an ice cream truck in the middle of the Mojave Desert. The coach almost didn’t want to think about getting excited. The scrimmage opened with an explosive play from another tailback. Chris Carson turned a short Russell Wilson pass into a long touchdown, more than 70 yards. Carson played only four games last year before being lost for the season injury, so he nearly counts as a newbie. Carroll started to warm up to the chance to fulfill his public commitment to a running game this season that would silence chuckles, snickers and guffaws from opposing defenses. “We have great versatility in our running backs,” he said.”Everybody can do everything — run, catch and block. It would be easier to accept the optimism if it was coming from someone other than the same guy who a year ago thought Eddie Lacy was a good idea and that Alex Collins, who gained 973 yards for the Ravens last season (11th in the NFL) after being cut by Seattle, was not. Nevertheless, the glimpse Saturday suggested that the 2018 changes made some actual sense. The optimism even bled over to the passing game, where rookie Will Dissly, 22, and veteran Brandon Marshall, 34, hauled in TD passes. Dissly, the fourth-round pick from the University of Washington, came in for a large salute from Wilson. “In my opinion, he’s one of the stars of camp,” he said. “You expected a good player, but he keeps showing up. We’re all impressed by his professionalism. He does the little things, like transferring the ball and putting it away. Marshall, the former All-Pro recovering from foot and toe injuries, fought off rookie defender Tre Flowers to haul in a spot-on toss from Wilson in the end zone. Carroll guessed that in camp so far, Marshall has been targeted about seven times and had three or four TDs. “I wasn’t expecting it,” Marshall said. “Those are plays needed to get your confidence — the plays you don’t expect. With Russ, you gotta ready for whatever. You never know. Carroll conceded that coming back from physical rehab, Marshall lacks endurance, playing only about a dozen snaps Saturday. But that’s fixable. There is no defense for his 6-foot-4 height. Wilson a year ago had a big target in 6-7 Jimmy Graham, but he was a tight end and the Seahawks offense had a hard time getting him the ball in space. Marshall is different. “His size and his understanding of how to get open, and understanding his release, is pretty exceptional,” Wilson said. “We’ve had great receivers here before, but Brandon’s size . . . and he’s caught so many football, leading the league in several categories. Given the abrupt exodus of so much premier talent from the roster, the Seahawks are desperate for mass production from the unheralded. 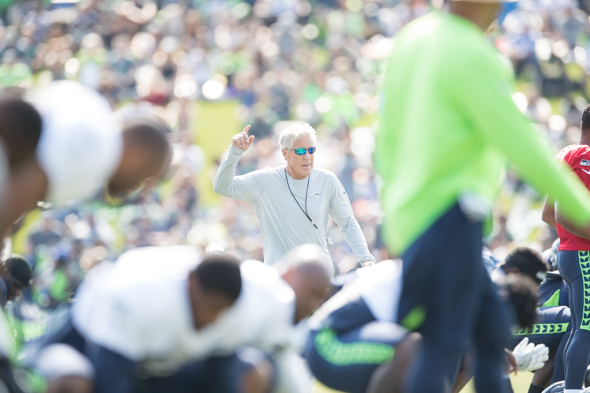 A scrimmage proves nothing, but after a tumultuous off-season, most Seahawks fans would embrace a glimmer. No Rocky Road on the ice cream truck, I guess. I can’t wait! Now I want a #20 Blue Angel jersey! I’m sure Canlis will seat you at a window table with that. They call me Mr. Sunshine. Can’t help but feel that the SeaHawks as a whole are going to be quite underrated this year. . .just feel like they are due better luck with injuries this year. . they are younger and should have a running game. As well as a younger hungrier defense and a more reliable kicking game. . I like starting with Denver and Chicago both 5-11 last year. The Cowboy game will tell us most of what we need to know about this team. . .and Russell Wilson is well. . . Russell Wilson. . the man is a winner and I look forward to some next level play from this guy. .the legend continues. As the 2018 Mariner Optimist, I hope you are right. Ping-ponging around the various websites, I see a lot of 5-11, 2-14 and a 6-10 here and there. Kevin Boilard from 247 Sports says 4-12. . Don’t know how this could be more disrespectful to Pete Carroll. Pete Carroll is 1 of only 2 coaches to win a national championship and a SuperBowl. His worst record as a coach was 1994 with the NY Jets at 6-10. Only in complete rebuild years has his teams won less than 8 games. . at worst were looking at 9-7 this year. .but I think we can win 11 if things go right even with a tough schedule such as this year. I think we’ll run the ball well this year and win at least 10 games. My Hawks season is much improved already for 2 reasons: No more mention of Soft Jimmy Graham, and no more bogus play calling by Bevell. I think last season was a major wake-up call for Pete and he feels he has something to prove.